Ready for a peek at Husky's 2012 moto models and product info? There's plenty to talk about, and we know you two-stroke fans will be loving the 125 smoker. Click each of the three models images for a larger version. GP/Motocross specialists, Husqvarna’s overhauled TC250 and re-worked TC449 are ready to take to the track; CR125 still in the action! The most aggressive of Husqvarna’s 2012 line of off-road motorcycles, the TC250 and TC449, are the embodiment of Husqvarna’s race technology. Under BMW ownership, the Italian manufacturer has drawn motor inspiration from its parent company’s rich racing background in designing the latest generation motocross/GP racers. The result is another significant step forward in design – further evidence of Husqvarna’s passionate dedication to competition and the pursuit of reclaiming its place as a leader in two-wheel technology. Not forgotten is the grassroots 125cc two-stroke class. It is still alive, and though the rules may have changed, the fun-factor remains unmatched. In the dedicated spirit of mixing gas, Husqvarna has returned for 2012 armed with the mighty CR125! 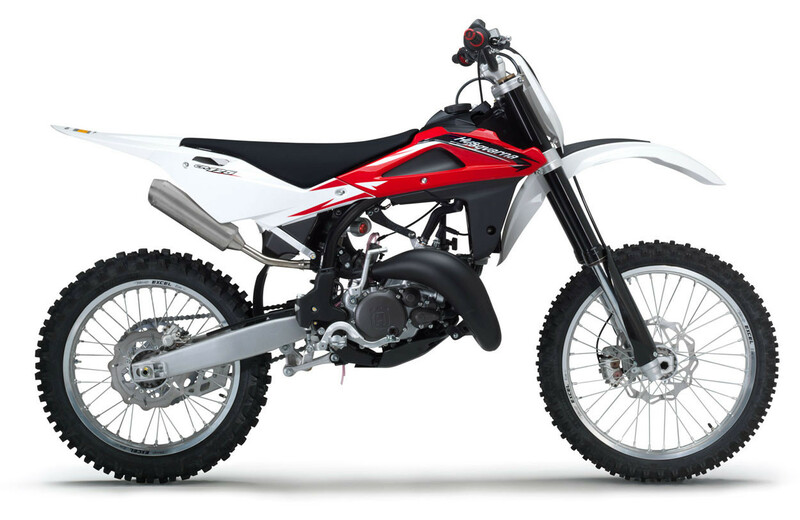 Taking it a step further in performance and versatility, the 2012 CR125 comes equipped with a 144 top-end kit complete with piston and cylinder. In the world of motocross, competition has never been tougher – both for racers and equipment – but Husqvarna has never been one to shy away from a challenge, and today’s cutthroat 250 motocross class is no exception. The TC250 receives another overhaul for 2012, bringing it another step closer to track supremacy. Bigger power, better handling and a dose of F1-inspired race technology ensure that the TC250 will be a force to be reckoned with in 2012. The BMW-owned manufacturer has pulled out all the stops in the bold new motor design. Calling on its rich racing background, the new piston and cylinder head are inspired by BMW Formula 1 technology. The new piston is lighter and freer-revving, and operates inside a cylinder head whose design originated in F1 development. Updated valve finger followers are also F1-type, and now DLC- (diamond-like carbon) coated for a long lifespan and silky-smooth operation. The TC250’s battery-less fuel injection system now operates with a Keihin (formerly Mikuni) ECU and throttle body. Three different preset maps are available on the ECU. The ignition is upgraded to CDI; the coil actually produces less voltage than the unit it replaces, but is far more efficient through capacity-style induction. A new airbox and revised velocity stack feed the revised motor, and altogether produce a substantial power increase on the TC250, particularly in high-range and overrev. The re-vamped motor is accompanied by an upgraded chassis. The TC250 shares the new all-black chromoly frame with the TXC, featuring increased tensile strength with structural reinforcement and the addition of plates near the steering head. Suspension receives an overhaul as well; the Kayaba 48mm closed-cartridge fork and link-mounted Kayaba shock are developed for (and by) U.S. motocross riders. • NEW Piston is lighter and freer-revving, based on F1 technology. • NEW Cylinder head design inspired by BMW’s F1 race program. • NEW F1-type valve finger followers are DLC-coated. • NEW All-black, chromoly-reinforced frame with increased rigidity and strength. • NEW Fuel-injected with battery-less Keihin EFI unit (formerly Mikuni). • NEW Ignition upgraded to CDI, comes with with three preset maps. • NEW Akrapovic exhaust system all new with power-boosting resonance chamber on the header. • NEW Revised Kayaba suspension front and rear tuned for demands of U.S. motocross riders. • NEW Airbox and revised velocity stack produce substantial top-end power increase. • NEW IPD (in-mold plastic design) graphics in striking new black/red color scheme. • NEW Silver anodized Excel rims. • Brembo brake hydraulics and Braking rotors. • Five-speed gearbox operated by Brembo hydraulic clutch. • Polished Grimeca hubs front and rear. After receiving a serious shot in the arm in the power department, the 2012 TC449 is ready to flex some muscle on the track! Husqvarna’s premier class motocrosser gets a substantial overhaul in the motor and chassis departments aimed at taking it to the next level of competition. Starting with the powerplant, the 449.6cc, fuel-injected four-stroke receives new valve timing, and DLC (diamond-like carbon) coating on the connecting rod for less friction and longer life. The ignition features new settings and a dual-map configuration, with the possibility to change the map while the engine is on by way of a switch on the handlebar. The new airbox is larger, carrying with it a revised velocity stack aimed at increasing mid-range power. High-performance WP radiators keep things running cool. These revisions alone create a surprising power increase across the RPM-range on the 2012 TC449. The chassis also receives its share of upgrades, creating a better overall balance while also effectively managing the TC449’s big power, ensuring the useable torque grips the ground with the utmost efficiency. The new all-black chromoly frame is updated with structural reinforcement in key areas, making it stronger and more rigid. The Kayaba 48mm closed-cartridge fork and Kayaba shock body are re-tuned for the specific demands of U.S. motocross. The shock also receives a progressive spring, which is softer on the initial stroke and allows the rear to settle in, helping to iron out the overall front-to-rear balance of the TC449 for optimum handling. Like its TE and TXC counterparts, the TC449 upgrades to the single-piece tail section that is narrower and streamlined for better ergonomics. The wiring harness is also lighter and simplified, utilizing higher-quality materials. • NEW Dual-map ignition with handlebar-mounted hard/soft switch. • NEW Valve timing creates significant all-over power boost. • NEW Airbox with larger intake and revised velocity stack for more mid-range torque. • NEW DLC coating on connecting rod for less friction and extended life. • NEW Kayaba suspension front and rear tuned for specific demands of U.S. motocross. • NEW Progressive shock spring is softer on the initial stroke, improving overall balance. • NEW All-black chromoly frame is stronger and more rigid with key reinforcement and new plates near steering stem. • NEW Cooling system upgraded with high-performance WP radiators. • NEW Streamlined single-piece tail section is narrower and lighter. • NEW Wiring harness redesigned to be simpler and more direct. Rediscover the ultimate in agility, lowest in price and easiest in maintenance with Husqvarna’s mighty eighth-liter two-stroke motocrosser! Competition comes first on Husqvarna’s CR125, which carries its existing race-tested technology and top-level components into 2012. The compact 124.8cc single-cylinder, two-stroke motor continues to sing at high tunes with a Mikuni TMX38 carburetor fed by V-Force reed valves, and like all of Husqvarna’s two-strokes, the CR125 features a Ducati Energy digital ignition. The six-speed gearbox is operated by a Brembo hydraulic clutch. Brake hydraulics are also Brembo while rotors are supplied by Braking. The CR125 receives the same updated frame as the WR125. The all-black chromoly frame features higher rigidity for better performance and longer life. The CR continues to carry the premium Kayaba 48mm closed-cartridge fork and proven Sachs single-shock which provide a plush ride. 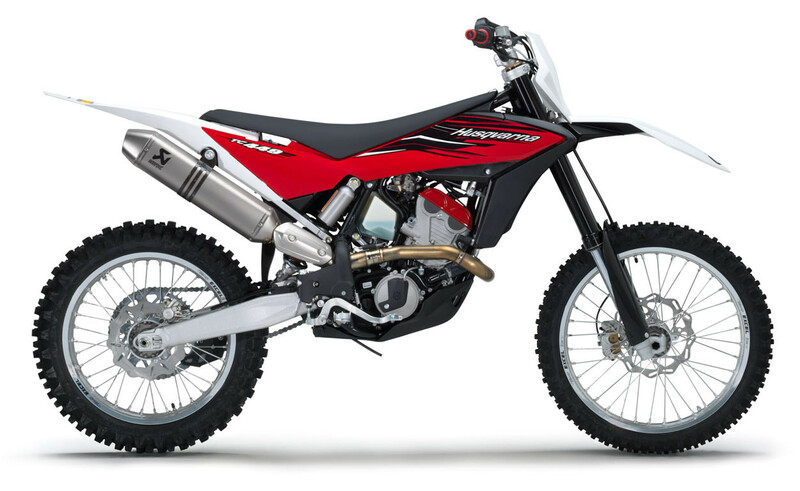 Along with the other shared changes across the Husqvarna line of motorcycles – silver anodized Excel rims and new black/red IPD (in-mold plastic design) graphics – bodywork on the CR125 features new airbox protection for the 2012 model. 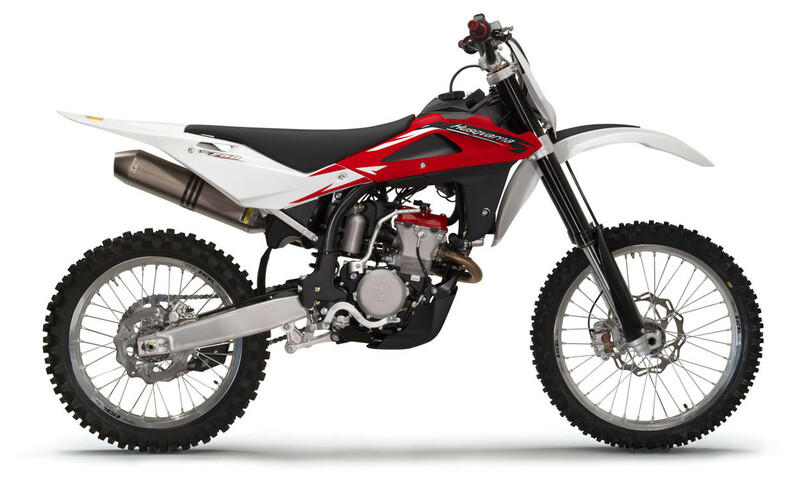 • NEW CR125 comes with 144cc top-end bore kit including cylinder and piston. • NEW All-black chromoly frame reinforced for greater tensile strength. • Kayaba 48mm closed-cartridge fork and Sachs shock provide a plush ride. • Trimmed with race-tested premium components like Ducati Energy digital ignition, Brembo brake hydraulics and Magura aluminum handlebar. • Compact, lightweight 124.8cc two-stroke motor with 38mm Mikuni TMX carburetor.